I had originally started this post as an 'boy it is a small trails world' post, about how closely connected most people are around the country to AMC. As staff have left the caretaker program, they have found themselves in the West, Midwest, South, Alaska, Antarctica, and even Germany (Guten Tag Tobias Carter!). As they move throughout the country, and across the globe, they build out the network. And so the small world continues to grow. This photo is of two caretaker alums Sarah Hayes (Nauman 2009) and Kate Orlofsky (Guyot fall 2013 and Speck! Pond 2014). 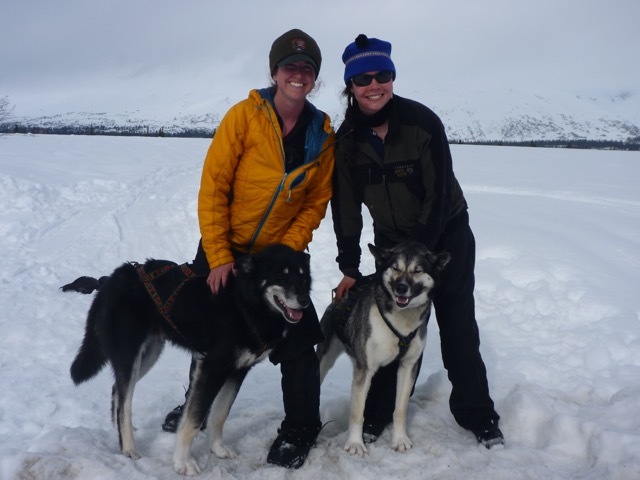 Both of them spent the winter together working in Denali National Park working with the Park Service kennels, driving dog teams on patrols through the Park. Sarah, after leaving AMC, has worked off and on for the Park since 2010, but has since landed a full time position with the Park and calls Alaska home. Kate is not new to the lifestyle of dogsledding, having spent two winters working for the Mahoosuc Guide Service in Newry, ME, with Yukon Huskies that are very similar to the Denali dogs. Kate feels an ultimate pull towards scientific field research, so I expect her to be falling into a PhD program at some point. I knew both of these incredible women during there time here at AMC. I thrashed around in the brush with Sarah doing boundary work along the Appalachian Trail. I sat at the edge of Speck! Pond with Kate, talking about adventures to be had and how to make decisions about life. I shared so much laughter with each of them, and have stayed in touch with both of them as their adventures took them far and wide. (I also was invited to Sarah's wedding, and am still disappointed I wasn't able to make it work!). How I wish that I could have spent one week in their company in Denali this past winter. Both Kate and Sarah exemplified, during their time here, all that a caretaker can be. They were positive and sought to make positive change in the world. They both did incredible work and served above and beyond in their posts as stewards. It is powerful to know that they are continuing to make the world a better place, just as they did here in the White Mountains. In addition to writing about how caretakers rule, it is also worthy to note their gender. When Sarah was a caretaker, she was one of two women of 12 caretakers. When Kate was a caretaker in 2014, she was one of four in a team of 12. This year, 2016, I am thrilled to announce that seven caretakers out of 12 will be women. Yes. That's over 50%. Women in the trails field have for a long time been rare. A photo of the AMC trail crew from the 1970s hangs in our Trails offices, and there are no women. During the 10 years I've been involved with the caretaker program, the percentage of women has been usually around 30%, and that percentage also reflects the percentage of women who applied. When I was hired into my position in the Trails department, I was the only full time woman in Trails at the time. Gender is only one of the many lenses that one can apply to the world, one of the many ways to measure equity. In recognizing gender, I am not disregarding the various other forms of inquity. I am acknowledging it because when there are more women in the caretaker office, it feels different. Caretakers rule. And I'm so thrilled that, for the first time, there are just as many women as men.